Have you heard of The Merchant of Venice? It is one of the most perfect examples of tragicomedy. You cannot really determine if it is a tragedy or a comedy, even though the words perfectly contrast each other. At some points you feel buoyant and in another blink you are laid down by stockpiles of misfortunes. The overall mood, is neither bright nor gloomy. It has something from both these worlds. Life is Beautiful is a story of a loving father and a caring mother, and a birthday gift for their son. 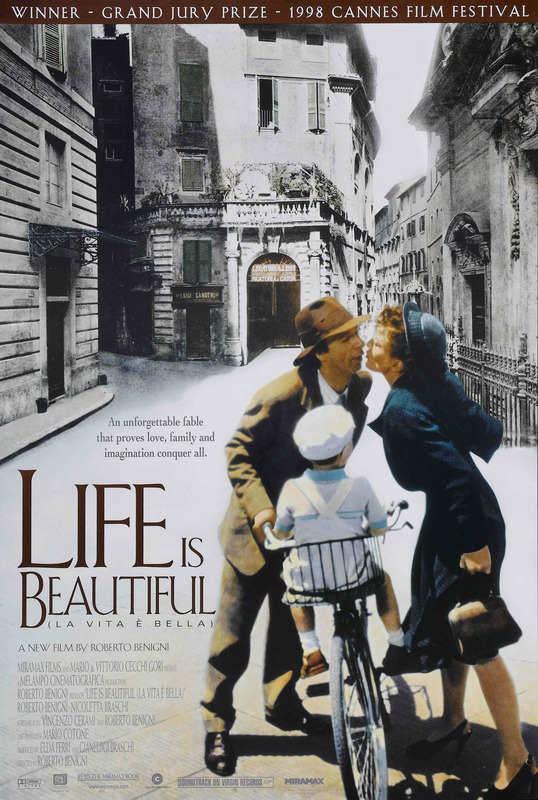 Life is Beautiful is a fable of the family of an Italian Jewish book shop owner, captured by the Nazis. For me both these one liners make complete sense. Because the film, as a whole cannot be termed as one story. The life of this family is the story of the film and there are two drastically opposite episodes in this story. I feel there are six acts to this film. Or you may rather say, there are two halves of three acts each. I belong to a constitution of film lovers that believes in the importance of the title of the film. I like titles that are ambiguous, yet make sense on watching the film. There is some surface area to them, as well as some volume. They mean something at first, but when you go pause your life and think a little more about it; they mean something even deeper. A whole generation of fathers, sacrificed their lives so that their sons can live in a beautiful world believing that life is beautiful. Also, the family is taken captive on the day of Joshua’s birthday. So what follows, he considers as his birthday present. Life is Beautiful, indeed it is! But one must cloak all the problems and believe that everything is going to be alright. That ultimately if he doesn’t give in; his faith, his patience will be rewarded. That is how one can make his life beautiful. By having faith in it. It is astounding how the film manages to switch so quickly from an exaggerated (almost slapstick) comedy to a tragedy. And it does it with such an ease. When dealing with a dramatic subject, not all from the audience can have empathy for your characters. Most of the people go to the movies to escape from their troubled lives. So it is important to have a comic relief to manage the grip on the audience when the subject is burdensome. Over here, the film deals with – Nazi concentration camps – a very emotional subject for many if not all. And yet, even after the switch; the film gives you some moments to smile. Another director could’ve shifted to a completely cheerless treatment in the second half. But Benigni keeps rewarding your faith throughout. Charlie Chaplin once confessed that one cannot make a comedy out of the Nazi era, like the one he made The Great Dictator. Benigni successfully falsified his claim by making this masterpiece. I am not the one who usually ends up weeping after an emotionally intriguing movie. However, I felt a lump in my throat after watching Life is Beautiful.